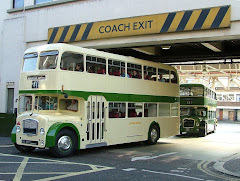 A very unique vehicle to arrive at the BusWorks is a Duple Viceroy of 1969 origin that started life with Premier Travel of Much Wenlock. Registered UOX533G, the vehicle is bodied on a Ford R192 lightweight chassis and the body was built only a stones-throw away from the BusWorks' site in Blackpool where Duple was based. The coach arrived at the BusWorks on 23rd January for a complete restoration. It is certainly a challenging job - the coach body is completely rotten below the waistrail and will need a complete rebuild, whilst the body itself has literally "broken its back" around the rear axle.